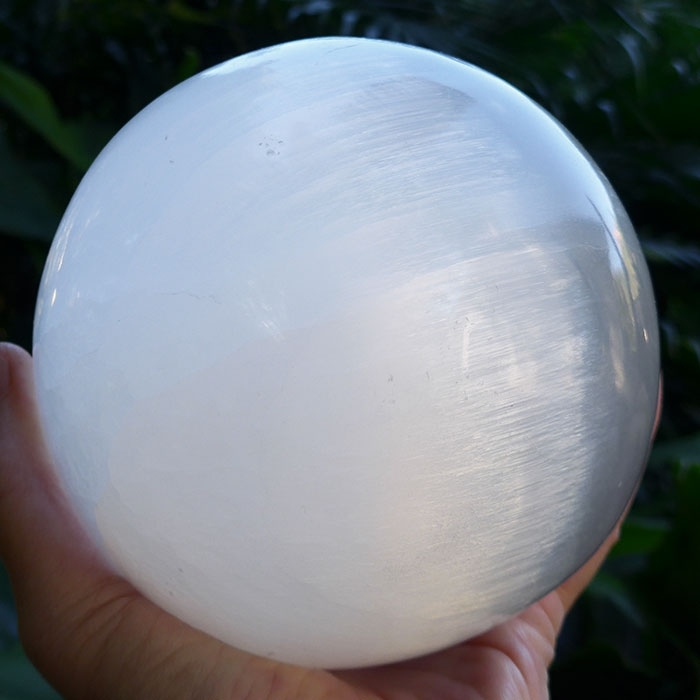 Dimensions (HxWxD): 5" x 5" x 5"
This Giant Selenite Sphere weighs 2237gr or 4.9 pounds and has a 5" diameter. It has a remarkable ability to reflect even a faint source of light in any room, radiating energy from a bright band across its surface. 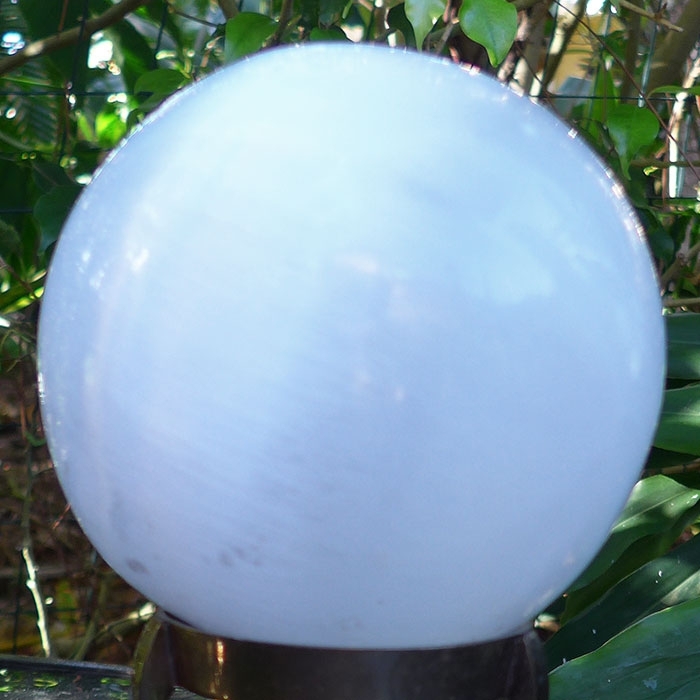 This sphere comes to you after being cleaned and charged with Universal Life Force energy. 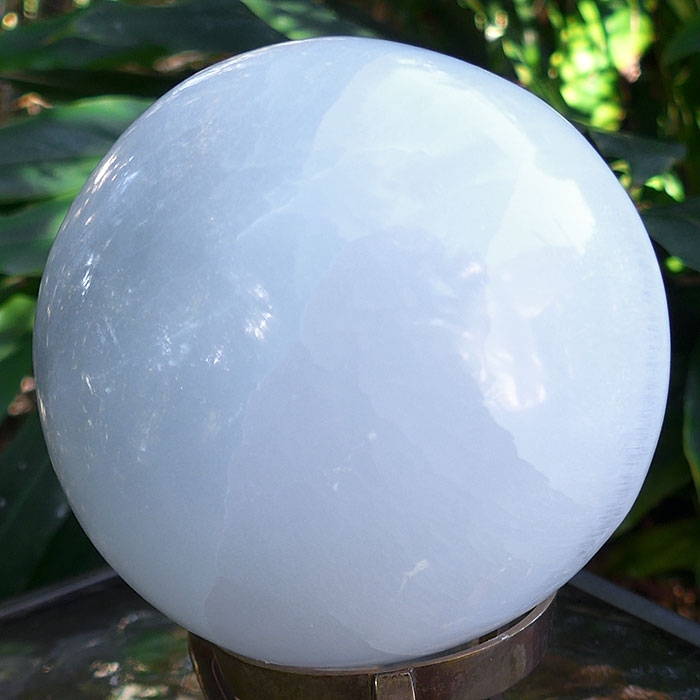 This giant selenite sphere comes complete with its own FREE display stand for your convenience. It has been given a Reiki attunement, after being placed in the sun -- and in moonlight -- for additional energizing. It is ready to be placed on an altar or elsewhere in any room to subtly alter the energy in the space. It is also suitable for use in divination. This unique collector's item exhibits a characteristic brilliant watery reflection on its surface as light changes or one's point of view shifts. This is known to gemologists as "chatoyancy". 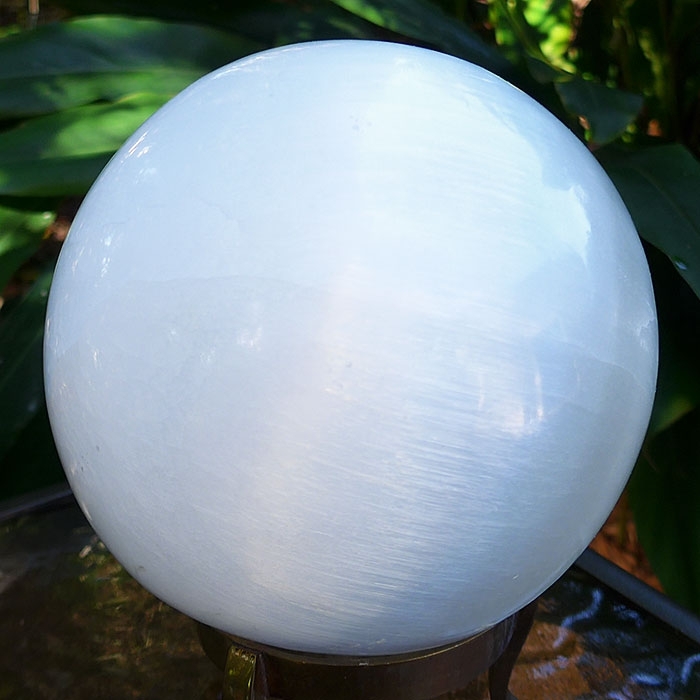 Selenite Spheres radiate a vibration of mental clarity, and can be excellent doorways to higher realms, so they can be a point of contact with spiritual guides and teachers, both those in physical bodies at this time and those whose energies are primarily elsewhere. Some crystal workers believe that Selenite can assist us in accessing past and future lives and therefore find them helpful in processing patterned stuck energy. Because these "future lives" indicate the outcome of the flowering of our present seeds of karma, it is clear that they indicate events which are likely to occur later in this life, to prompt resolution of karmic imbalances we carry with us from our past, and if the imbalances are not equilibrated in this life, the same conditions will occur once again in "future lives". 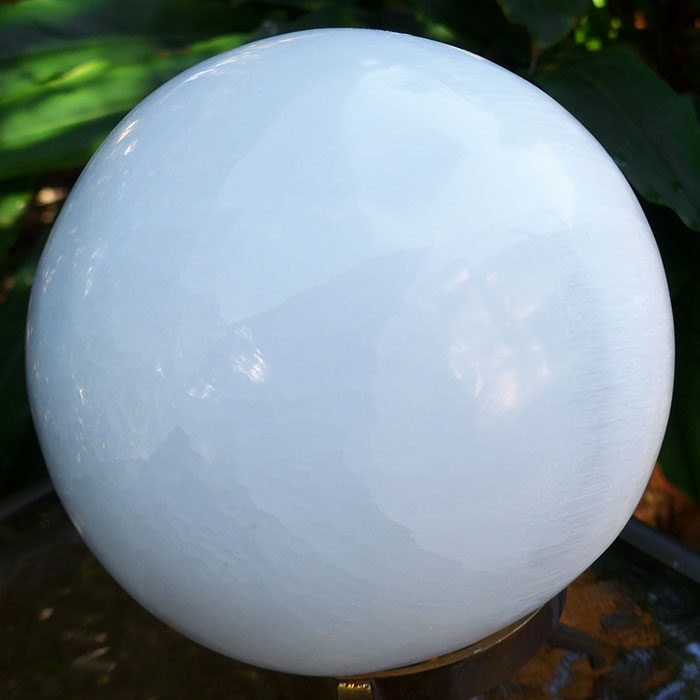 Thus the Selenite Sphere is an ideal tool for divination, providing us with direct insight into the most important karmic debts we have to pay, the most important elements of our future life script we have yet to encounter. Selenite promotes self-expression, sharpens the user's ability to discriminate between options in life, and to make clear and balanced judgements in matters of business and in disputes of all kinds. 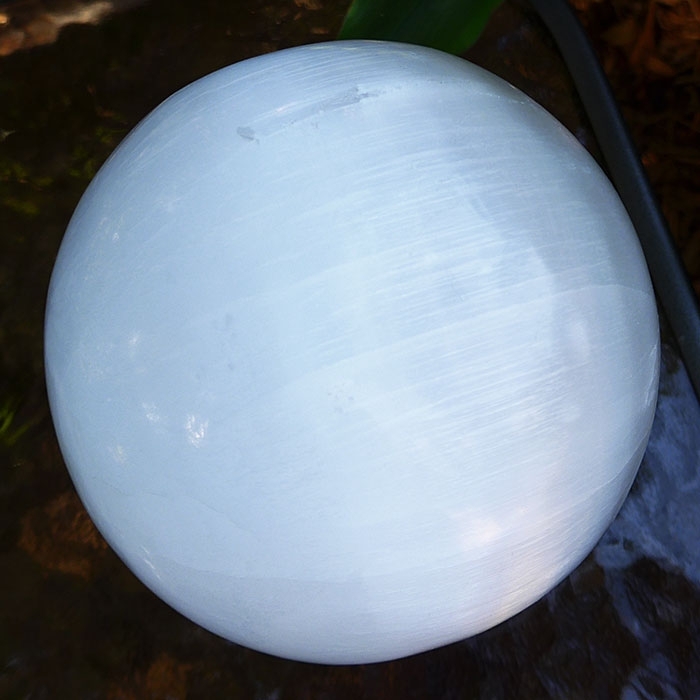 Selenite attracts material success. Selenite has been used as a tool to enable lightworkers to "see" inside the physical body to determine where energy imbalances and unhealthy conditions predominate. Selenite has also been used to adjust the energy in the spinal column. Moving the selenite up the spinal column removes energy blockages, and moving the selenite down the spinal column smooths out energy flow. Note: Weight above is shipping weight. Actual weight is 2237gr or 4.9 pounds.